Synopsis: Set in a world of extraordinary circumstances, filled with stunning visual imagery and unforgettable characters, the DARK TOWER series is unlike anything you have ever read. The final three books in the Dark Tower saga are among Stephen King's most divisive works. Written in the years immediately after getting run over on an afternoon walk, the three novels in question— Wolves of the Calla, Song of Susannah, and The Dark Tower — show King entering and settling into an existentialism period in his writing, which makes perfect sense. The guy was well into his 50s when he came face-to-face with death. That would make anyone think. His ruminations on life and death form a thread that runs through almost all of his 21st century output, making it a bit more nuanced and contemplative than his earlier work. This began with From A Buick 8 and a few stories in Everything's Eventual, but nowhere is it more apparent than in this story, the fifth entry in the Dark Tower cycle. While Wolves of the Calla is about the Ka-tet — Roland, Susannah, Eddie, Jake, and Oy — coming to the rescue of the folken of Calla Bryn Sturgis, on a subtextual level this story is all about saving Stephen King. The Tower is falling, and its creator is in grave danger. Needless to say, this story is very meta. The previous books in this series contain casual references to and appearances of characters from other King stories, but this book plunges the reader right into Stephen King's — and our — own universe, making King a very important player here and in the two novels to follow. He is the characters' creator, and seeing them coming to grips with that is uncomfortable and intriguing. It makes perfect sense — after all, this is a series about not just one universe but all the universes — and I love King's decision to insert himself into the story. It's bloody genius. Some fans don't like it . . . some even hate it, claiming the three final novels of this series fall apart because of this artistic choice. I get it; it's a valid complaint. I love it, though. This book was written by a very different man than the one who wrote Wizard and Glass, which must be kept in mind. The writer of Wizard and Glass would not have put himself in the fiction, methinks . . . But the writer of Wolves certainly did. So . . . 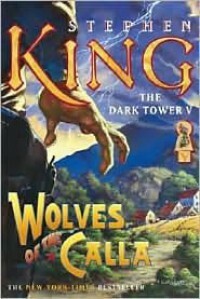 The question bears asking: would Wolves of the Calla have existed if King hadn't been involved in his accident? Maybe. Possibly. It's almost impossible to know for sure. I lean toward no; I think the Path of the Beam went eschew on June 19th, 1999, and the Dark Tower became something else altogether. King's accident is in almost every page of the text, and it will bear an even heavier weight on the two books to follow. I am not really sure where I'm going with all of this, and perhaps it's coming off as the incoherent ramblings of a rabid fanboy. If so, I'm sending my sincerest apologies through my computer screen right now. There is so much I could and would like to say, but I will muzzle myself right now. I'll try to land this plane with a few more quick thoughts, and then I'll be out of your hair. I know this book is challenging for many, but it might just be my favorite Dark Tower novel. It's certainly in close contention with The Waste Lands for that position, and I think Father Callahan's gorgeous tale of his post-'Salem's Lot travels might just give WOTC the edge. This is a long, long story — a story that isn't exactly inviting, either, but once the reader works his or her way into it the treasures to be mined are endless and breathtaking. King takes his time with the set-up here, and everyone has a story to tell, but I wouldn't cut a single page. I simply love everything about it — the sublime descriptions of the Calla and the folken who live there, the evolution (and, in some ways, devolution) of the relationship between those in the Ka-tet, friggin' Donald Callahan (!!!! ), the todash scenes, the battle against the wolves themselves. . . . It's all wonderful, and I could not utter a single grievance if I tried. This book is an extraordinary tale all its own, while masterfully setting up the final act of King's magnum opus. This book helped bring me out of one of my too-frequent reader's blocks. I'm giving it five Oritza plates.